Act 31, Session Laws of Hawaii 1947, approved May 2, 1947, entitled an Act to officially establish the name of Honolulu Airport changed the name of John Rodgers Airport and Keehi Lagoon Seaplane Harbor to Honolulu Airport. This was in line with the Mainland practice of changing longstanding names of airports to the name of the city where the airport was located. The designating of airports by the geographical location eliminated the confusion in the selling of tickets and operational communications throughout the world. Act 32 of the 1947 Territory of Hawaii Legislature transferred operation and maintenance of Territorial airports to the Hawaii Aeronautics Commission effective July 1, 1947. Construction was to continue under the Department of Public Works. 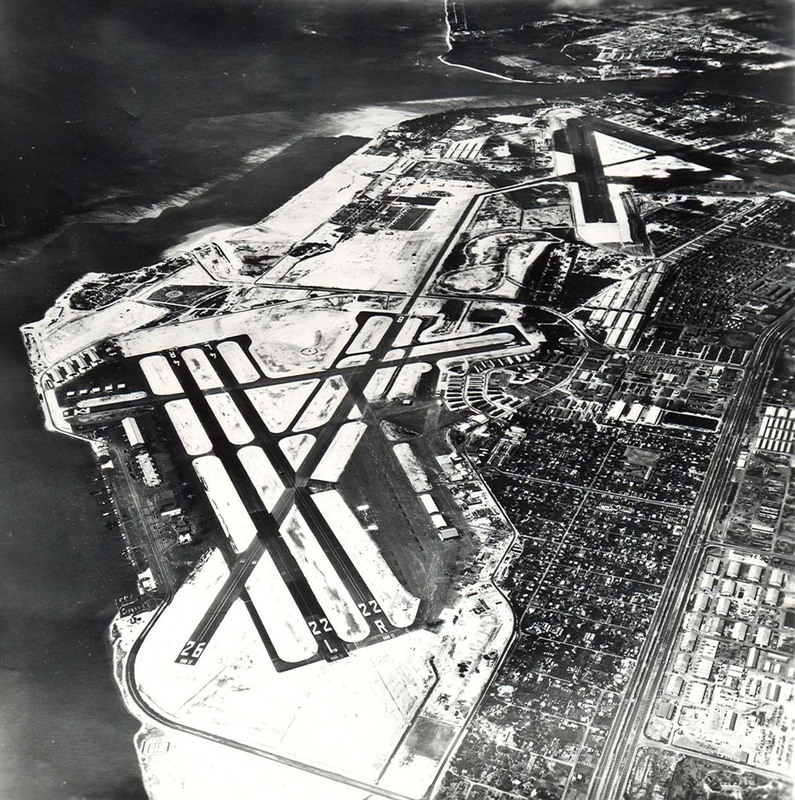 In 1947, all commercial overseas flights between the West Coast of the U.S., Australia, the Philippines, and East Asia were operating from the Overseas Terminal on the south side of the airport. 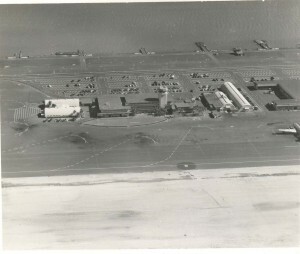 All interisland operators were based on the north side of the airport. The buildings and other facilities at Honolulu Airport in 1947 were all of a temporary nature, having been constructed by the Navy during the War. The passenger terminal buildings had been remodeled and the adjacent area landscaped. Located in the lobby of the overseas terminal were: RCA Communications, a barber shop, flower shop, and blind vendor’s newsstand. 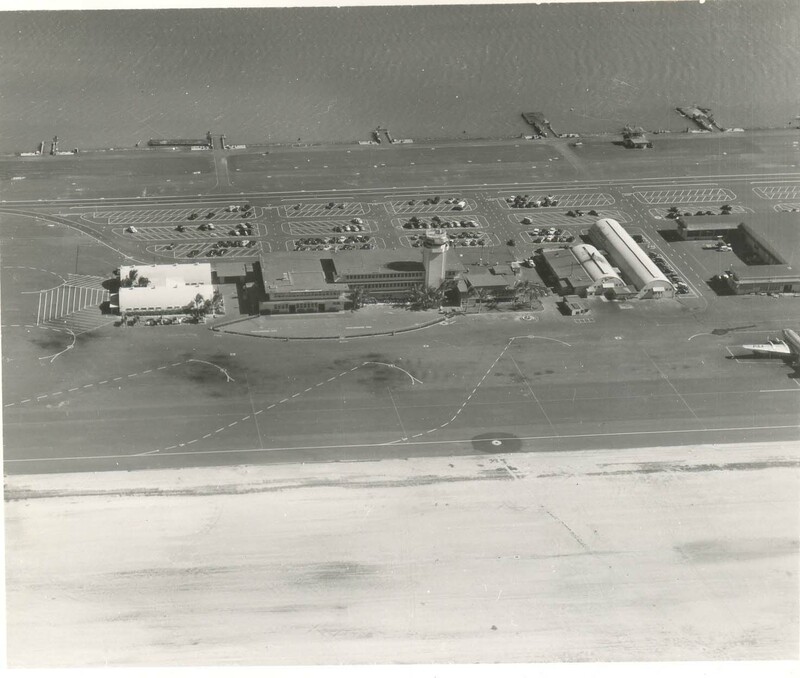 In 1947, long range plans were being developed for a terminal area on the north side of the airport which would be used jointly by both overseas and interisland airline operators. During the year 1947, commercial airlines carried 63,055 passengers between Hawaii and the Mainland of the United States, as compared to a total of 26,000 passengers carried by ship in 1941. Control Tower Reports for Honolulu Airport showed an average of 7,571 landings per month for the period ending June 30, 1948. Interisland revenue passenger air traffic by scheduled airline during 1947 numbered 314,608, as compared to 48,855 carried during 1941. The development of air freight had taken place in Hawaii since the end of the War as perhaps nowhere else in the world. Cargoes of every conceivable nature including fresh fish flown from French Frigate Shoals, live stock, dressed beef, fresh vegetables, furniture, machinery, fresh milk, and in fact anything and everything were being transported by air. In 1947, Trans-Pacific Airlines (later to be named Aloha Airlines), operating DC-3s, had an application pending before the Civil Aeronautics Board for a certificate as a scheduled air carrier; Hawaiian Air Transport Service with twin-engine Beechcraft airplanes, operated a deluxe charter and tour service; Hawaiian School of Aeronautics operated a ground and flying school; Cockett Airlines operated a charter service with twin-engine Beechcraft planes; Andrew Flying Service operated a charter service and flying school; K-T Flying Service operated a charter service and flying school; and Island Flight Service had consolidated with Aero Service and Supply in the operation of a repair, rental and charter service. Trans Air Hawaii, initiated four DC-3s in freight and express service and carried a total of 12 million pounds of cargo during the year 1947. They replaced their DC-3’s with larger C-46 cargo planes. On November 27, 1947 Trans Air received a CAB Letter of Registration to fly a regular freight schedule between islands. On April 1, 1948, a lease was entered into with the Spencecliff Corporation for the operation of a restaurant, coffee shop and cocktail lounge. The lessee was to expend not less than $40,000 for improvements to the existing restaurant building and the Hawaii Aeronautics Commission provided $15,000 towards the improvements. The project was to provide Honolulu Airport with a restaurant comparable to Mainland airports and provide the airport its most important source of non-aeronautical revenue. Air traffic control was a function of the Civil Aeronautics Administration which maintained a 24-hour air-ground air communication by means of radio-telephone and radio-telegraph with aircraft operating overseas and interisland. Space was provided in the overseas terminal for these facilities. The U.S. Weather Bureau was also provided space in the Terminal Building for an Airways Weather Service. The office furnished terminal and route weather forecasts for interisland and trans-Pacific flight operations. U.S. Customs, Immigration, Public Health and Agriculture were also located in the airport for the processing of all foreign passengers arriving in Hawaii via air or en route to the continental United States. In addition, all passengers departing for the West Coast were cleared through Immigration at Honolulu Airport, thus eliminating delay upon arrival at a Mainland airport. The baggage of all passengers was inspected by the U.S. Department of Agriculture for fruits, plants, seeds, etc. that were subject to quarantine. New rules and regulations of the Territorial Airport System were promulgated by the Hawaii Aeronautics Commission and approved by Acting Governor Oren E. Long on June 2, 1948. These rules were the first revision since the rules and regulations promulgated by the former Territorial Aeronautical Commission on July 12, 1930. These rules, in addition to regulating airport and aircraft operation, enabled the Honolulu Police Department to enforce vehicular traffic regulations at Honolulu Airport. On June 4, 1948, Philippine Air Lines placed DC-6’s in operation between San Francisco and Manila via Honolulu Airport on the first sleeper service across the Pacific. The Civil Aeronautics Administration moved their communications facilities to the third floor of the Honolulu Airport terminal building and the U.S. Weather Bureau established an airport weather station there. On July 30, 1948 Northwest Airlines received certification for a route between Honolulu and Seattle, Washington. 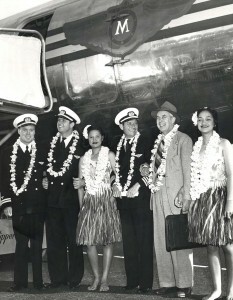 Northwest completed its survey flight from Portland to Honolulu with 27 passengers on November 11, 1948, and its inaugural flight on that route on December 2. It was the first airline granted permission to fly scheduled service between Portland-Seattle and Honolulu. On July 30, 1948 the Civil Aeronautics Administration announced that Honolulu Airport ranked 30th in volume of traffic among 143 CAA tower controlled airports in the U.S. During July, Honolulu Airport traffic totaled 17,738 operations. Hawaiian Airlines, Ltd., set an all-time record by carrying 2,122 passengers on August 22, 1948, and a record 42,793 passengers for the month of August. Pan Am made the inaugural flight between the Pacific Northwest and Honolulu on November 25 with 19 passengers including a full-blooded Eskimo girl as their guest. The flight continued on to the Orient. The return trip from the Orient to the Pacific Northwest went via Honolulu on November 27. British Commonwealth Pacific Airlines inaugurated DC-6 service through Honolulu from Sydney, Australia, to Victoria, British Columbia, Canada on February 16, 1949, by setting a new speed record of 18 hours, 40 minutes flying time from Sydney to Honolulu. Trans-Pacific Airlines (Aloha Airlines) received CAB certification for scheduled passenger and cargo operations serving all major airports with five DC-3 28-passenger planes. By 1949 air traffic control responsibility was transferred from Hickam Field to Honolulu Airport. 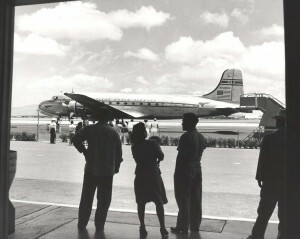 Pan American Airways’ first Stratocruiser arrived at Honolulu Airport. It was placed on display for inspection by the public. The largest crowd ever to assemble at the airport stood in line for hours to go aboard the plane for a preview of the largest passenger plane to be put in commercial operation. Pan American Airways’ Stratocruiser completed the first commercial non-stop flight in history from Tokyo to Honolulu, covering the 3,933 mile distance in 11 hours and 24 minutes, without making the customary stop at Midway for refueling. The B377 Stratocruiser continued on to Los Angeles, completing the Tokyo-Honolulu-Los Angeles trip in an elapsed time of 19 hours and 48 minutes. The Tokyo-Honolulu record was later broken by another PAA Stratocruiser which flew nonstop in 10 hours and 55 minutes. Clark M. Kee, nationally known airport designer and engineer, began work as a consulting engineer in 1949 for the HAC to design a master plan for the Territorial Airport System. 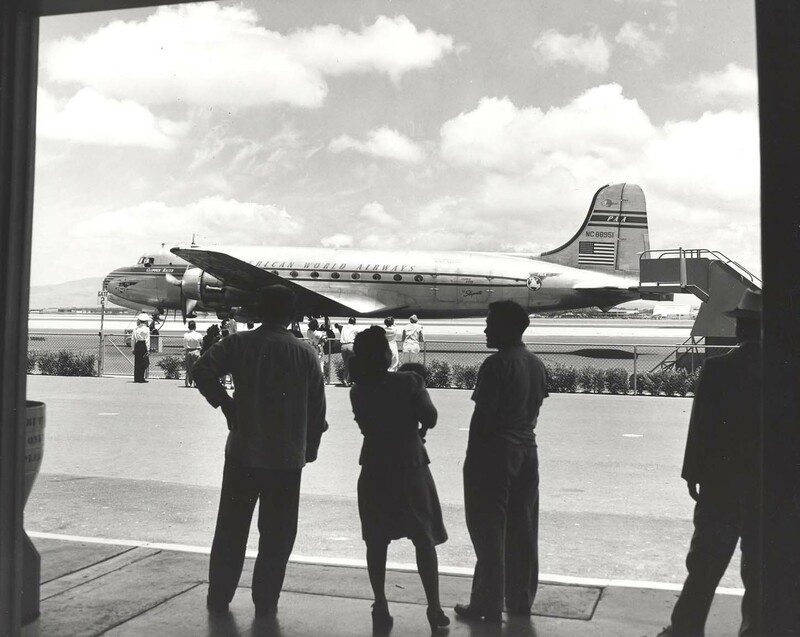 For more about the history of Honolulu International Airport, click on a decade below.